The Co Londonderry beef and sheep stock judging heats were held on Tuesday, June 19th at Swatragh Mart. The judges were Joe Bamford, Paul Taylor, Ian McCaughern, Keith McNeill, Sandra Hunter, Richard McGinley, William King and Thoburn McCaughey. The YFCU would like to take this opportunity to thank the judges for their time and expertise and thank Swatragh Mart for hosting this event. 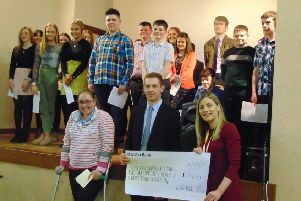 Thanks also go to sponsor Ulster Bank and the representative from Ulster Bank, Martin Convery who attended on the night. The top four competitors from each age group will go through to the NI final which will be held on Thursday, July 5th in CAFRE, Greenmount Campus.